Some years ago, I preferred seating on the back so that I could easily read the surtitles. I am now a more experienced opera-goer and lately I have been trying to avoid looking at the surtitles because it prevents me from focusing on the dramatic thread. Moreover, I trust the power of the music more than the text. Therefore, I now prefer the first few rows of the stalls. But it is entirely up to you to decide where you want to seat, keeping in mind that the majority of the seats at the old Mariinsky are bad seats. Keep reading to find all that you need to know about this topic. The two opera houses couldn’t be more different from each other. 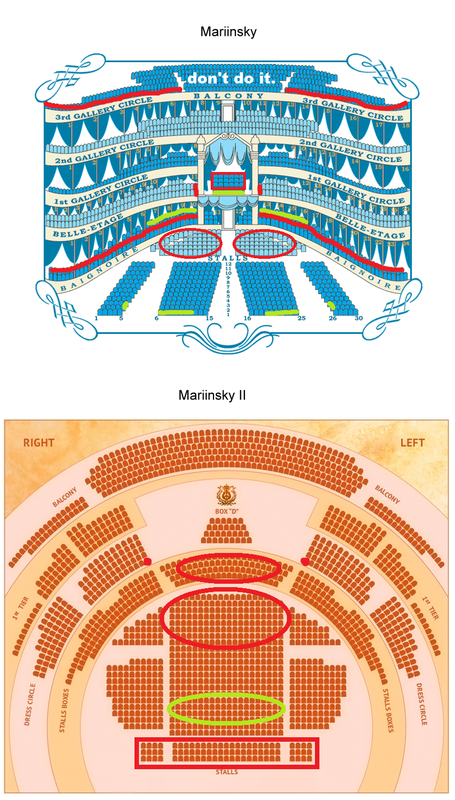 Virtually all seats are "good" at the Mariinsky-2 whereas most seats are bad at the old stage. Don’t Take Your Chances With Seating. Avoid Seating on the Back. In all cases, avoid the back rows because they are far away from the stage and it is very likely that you will get heads in front of you; also, there may be a photographer making noise next to you. Check my Sad Stories below. My Personal Choices if I Were You. 1) At the Old House. If you are a tourist (unless you have a Russian student ID), you will have to pay a full price ticket. That means that the first 15 rows or so in the stalls have the same price. My advice is to sit on the first row so that you at least won’t have to deal with the heads for sure. Unless you’re watching maestro Gergiev or Pavel Smelkov, I cannot promise that the conductor won’t be noisy. Bear in mind that you will have heads virtually everywhere in the stalls except for the first row. You will even have heads in the central boxes, 1st row, parterre level. If you're going for the ballet, the first row of any balcony, near but not contiguous to the Tsar's Box, will be a good choice. Forget about surtitles unless you’re watching a Russian opera. All non-Russian operas will be surtitled in Russian only. As a rule of thumb, don’t seat in front of row 4 at the Mariinsky-2 if you care about the surtitles; the first row will do fine at the old stage. Sitting on the Tsar’s Box is considered a must-do by many online advisors. Personally, I think it is an overrated experience and I don’t advise it because (1) it is expensive, (2) seats of equivalent quality are available at lower rates and (3) I have several sad stories about sitting on the Tsar’s Box. Check Sad Story #1 below and the post on The Audience at The Mariinsky for another. 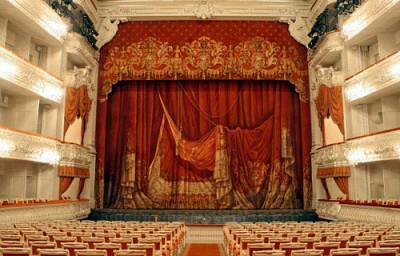 I would advise you to just ask the lady at the entrance of the Tsar’s Box to let you take a sneak peek during the interval; I have seen many people doing this and the ushers will usually let you in. But if you insist on sitting there, here’s what you need to know. First, the Tsar’s Box is always reserved until a few days or a couple of weeks before the performance, should a diplomatic commission want to sit there. Sometimes availability will be shown online; other times you will have to ask directly in a ticket office. 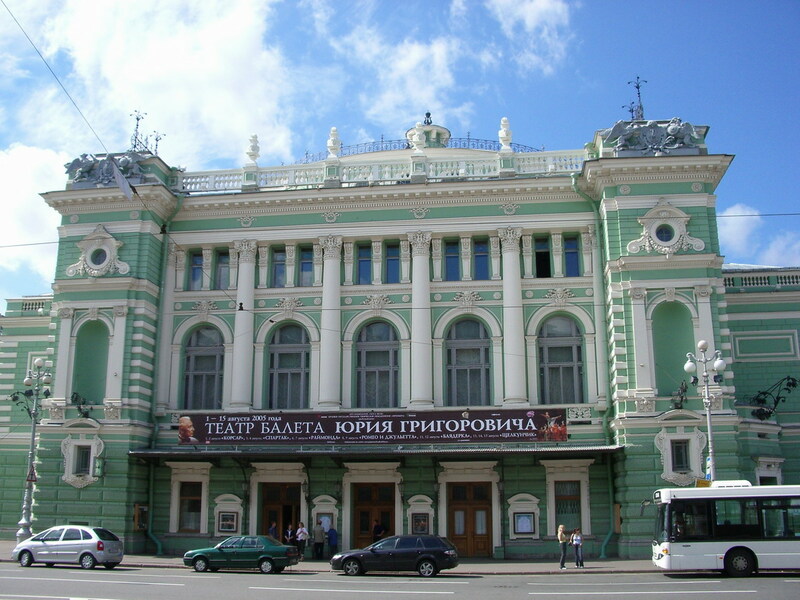 Ticket offices are at the opera houses and in most places reading Касса or КACCA in the main streets. Also, don’t seat on the Tsar’s Box unless it is on the first row. You will understand why when you see it. 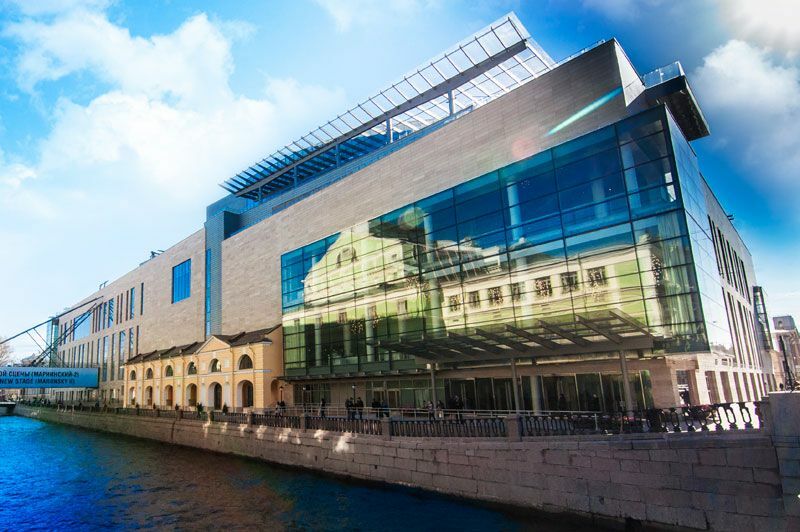 If you are on a tight budget, here is a secret about the Old Mariinsky. The best seats in the cost-quality category are in the 3rd row (yes, 3rd; not 2nd) of the first few central Stalls Boxes. You will save about 30%. The seats are not too comfortable but they have NO heads. You may have to deal with a chandelier though. At the Mariinsky-2, any seat will be fine if it matches your budget. Thank me later. Why You Don’t Want to Be Late. Unless you have that typical Russian skill called, hem, bribing, you will have to sit in the balcony if you’re late. (Paying "facilitation fees" is possible and I have heard of people who did it several times). It can be an interesting experience if it is at the Mariinsky-2, which has awesome acoustics up there. However, sitting in the 19th-century wooden benches with people making all sorts of noise and more latecomers coming in at the Old Mariinsky, with restricted view, you can take it from me—you don’t want to be late. There are some seats that look better than they actually are. I have marked some of them in red on the map, meaning that I would never seat there again. The green seats are the recommended ones. The seats that I haven't assigned to a color: either I have never tried them or just would not risk sitting there if I were you. For tips on buying tickets, using the Internet platform and resellers, please check my post about it by this link. The opera was Mazeppa. During Act 1, I was sitting in the stalls behind a gigantic man who wouldn’t stop taking pictures and wouldn’t get down on his chair. I was given no choice but buying a ticket for the Tsar’s Box, where I sat throughout the rest of the performance. Up there, the view and the acoustics were amazing but I still had to cope with the guy down in the stalls, who kept taking flash pictures throughout the performance. And so did many others. Unfortunately, it is a genetic behavior among Russian audiences. Learn more in The Audience at the Mariinsky post. So here’s the Tsar’s Box and why I advise against seating there: every time someone takes a picture it will drive away your focus on the performance. More Sad Stories: The Back Rows. I was late for buying tickets several times. One of those was for the première of the new production of The Barber of Seville. I bought seats for one of the last few rows of the stalls (parterre) at the Mariinsky-2. There was a photographer on the aisle who kept taking pictures with a very conspicuous “click!”. It was terribly boring and happened in all other performances when I sat on the back as well. I learned my lesson and didn’t seat on the back more than three times in about 30 operas. saying that you don't want to see the entire event -- which is what you get when you sit in the tsar's box -- is like saying you don't want to be in space and see the entire planet earth. Hi Placido, thank you so much for the invaluable information!! I picked a seat at Mariinsky based on your recommendation, thanks! I plan to go see Carmen at Bolshoi Theatre in Moscow in early Nov. Practically everything sold out except for a few singles. Do you think it is ok to watch the opera in Stalls (Parterre) section first row on the side? Will it be too close to the stage? You feedback is much appreciated. Unfortunately, I have never been inside the Bolshoi. If you still want my advice, go for it! I suspect it is not too close to the stage and it must have great overall visibility. Enjoy Russia!! Hello Placido, just want to thank you for this post! Thank you for the advice. Explains why the rows marked green are already sold out for May 9th. Please explain why the Baignoire seats are no good as they look a perfect location when compared to theatre seating in London. Centre baignoire: the first row is obstructed by the heads of the last rows in the stalls; the 2nd baignoire row directly faces the bodies of the people in the 1st row. In London, the first row is above the stalls level and the ones in the back have successively taller chairs, which solves the problem. Side baignoire: as you move away from the centre, visibility decreases due to the angle with the stage. Thank you very much for your advice. I am going to Pétersbourg the first week of march and after to read your advice I will book Carmen at Marinsky II row 5 or 6 Many thanks! Thank you for sharing your experiences, it helped me pick seats for my visit to Mariinsky 2 in May (Tosca). Went for row 6 in the stalls, a little left from the center. Quite honestly I don't remember but it is certainly better than Bayreuth! Hi Plácido, I bought opera & ballet tickets for summer 2017 from the Mariinsky online - I was only able to select the section though, not individual seats (unlike on the Bolshoi website). Do you know these 2 theaters well enough to tell if the seats I was assigned below are way off to the side? If so, are they still decent seats? Thanks for any advice you can provide. I enjoyed reading your posts & they were helpful! I'm so sorry I did not get back to you on time... it looks to me like none of those seats were ideal. Nevertheless, unless the seats for the opera were those right behind the crown over the Tsar's box, they shouldn't have been too bad. Hi Plácido! find this beautiful blog lloking for information on S. Petesburgo theatres. I´m going to S. Pete from the 7th of June to the 12nd. I´d like to get to some opera or ballet or even concert, and on those dates I only find Anna Karenina on MAriinsky II and White Nights on the Concert Hall, both the 8th of June. I find Anna Karenina very attractive, but I wonder if I should wait and see if something is scheduled for the Old Building. Meanwhile I could lose tickets of the Mariinsky II, so I don´t know, what would you say? Your alteratives are: The White Nights (festival); Anna Karenina, Le corsaire (ballets); The Magic Flute, Eugene Onegin (operas). The latter are at the Mikhailovsky theatre. I would go to Onegin on the 12th if possible. First 4 rows or so could be slightly uncomfortable at the Mariinsky 2. As for the side boxes you mention, I've been told you need the right connections to sit there. In the first row you will directly face the orchestra, which I find quite distracting as the players walk around the pit all the time. Seat 5 in the second row is not that exposed to the orchestra and there is a corridor just by the side towards the centre, which allows for great visibility of the stage. This is my personal preference. Great to hear that you will be visiting this great opera house soon! Unfortunately I find those seats rather uncomfortable because they have the Presidential ("Tsar's") box by side. There is a wall in between that doesn't obstruct your view over the stage, but it does make your field of vision very asymmetrical. It also impairs the acoustics because the sound comes from one side only. Although that seat is not ideal, it is still OK. On the other hand, if you are very picky about your seats and can afford to, by all means get a better seat. Firstly, thank you so much for this blog post, its extremely useful. DRESS CIRCLE Box 13 (Row 3). How is the visibility from these seats? To be honest I have never sat there but assuming visibility is OK, then the seats must be elevated - therefore they should be long-legged chairs, which are not the most comfortable seats available at the theatre. If you're looking for a good value deal, that seat could be an idea if it costs 70%-ish of a stalls ticket. Hello Plácido. Extremely helpful post. We are going to Mariinsky Old theater for new year, to see Nutcracker and Le Bayadere. The most ideal seats (first row of stall, and first row of boxes) have been sold out. I am considering side (Seat 5/ 26 of Row 2/3). But could you let me know why such seats 5/26 in Row 2/3 would be better than e.g., Seats 5/26 in Row 4/5/6? Since they are side seats (seeking special visibility through the doorway besides it, and the zigzag position from the front row), shouldn't a little bit backward seats be better (with more angle to center of the stage)? Please kindly let me know. Many thanks! It is indeed because seats 5/26 in rows 2/3 have a better angle towards the center of the stage via taking advantage of the corridors. Hello there and thank You for a very helpful post Plácido! I was just wondering - how about the first row in the number 1 stall box for ballet? It´s the very first one on the right side. First, thank you so much! This blog post, its extremely helpful. 1)did the opera has a translation? 2) When they start to sell? 4)How do you say it in Russian? I am lost, where is the Hotel...? 1) "About the surtitles" acima. 2) Depende; recomendo que vá verificando uma vez por mês. Outras informações sobre hotéis e transportes em post separado. Thank you for the informative article. What about these 1st row seats on the far ends of the 3rd Tier? They sell for such a low price. Is it not possible to see the full stage from there?